OncoLink readers interested in purchasing a CD will recieve a 10% off their purchase by using the special discount code: blad7856. Matthew Zachary is the kind of story of hope that keeps the will and determination alive in oncology professionals, patients and families alike. Matthew, a talented musician, began performing piano professionally by the age of 16. At the age of 21, during his senior year of college, he began experiencing terrible headaches. The neurologic symptoms quickly progressed, rendering his left (and dominant) hand virtually useless. He was ultimately diagnosed with a rare brain tumor, most often seen in children under 12, called medulloblastoma. Although survival was a very real issue, Matthew was most concerned with whether or not he would regain his ability to play piano. What followed were several months of exhausting physician consults, surgery, and radiation treatments. After surgery, Matthew regained the use of his left hand, but the many years of piano lessons had been erased, and he would have to retrain his left hand. During the radiation treatments, the piano empowered him, and provided hope that he could survive. He forced himself to play everyday, even if just for ten minutes. Matthew scribbled notes of these sessions on staff paper, which became known as his scribblings. It was these notes that would, three years later, become his first professionally released album. In 2000, the follow up album, Every Step of the Way was released. These albums gave Matthew the chance to share with others what had provided so much hope for him during his treatments. We are only beginning to understand the effect music has on our emotional and physical well-being. For Matthew, music helped him through his darkest days, promoting a spirituality and well being he may not have otherwise been able to achieve. These albums can create an environment of peace and solitude for cancer patients and families struggling to get through the tough times. The albums have been added to many cancer center libraries and incorporated into traditional music therapy programs, most through the generosity of Matthew's company. In reviewing the many articles written about Matthew's story, I came across a quote from another patient that I thought was particularly poignant: "I, like countless thousands, strive for happiness and fullness of life, despite the circumstances. Last year, after two grand mal seizures, I was diagnosed with a brain tumor, followed by surgery and radiation. Thank you for sharing your legacy in your lifetime with those of us whose voices are silent, but hearts are full." But this music is not just for cancer patients - it is for anyone seeking relaxation and inspiration. Playing it on the car ride home during the five o'clock rush hour has been heavenly! 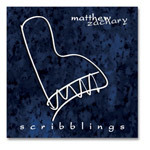 And I know a certain 2 month old who miraculously stops crying when Scribblings is played in the car. You see, in our fast paced, stressed-out world, I think we could all use a little musical relaxation and inspiration - and Matthew Zachary is just the guy to provide it. 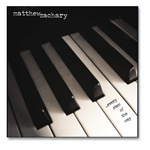 To learn more about Matthew Zachary Music, hear music samples, or purchase his music visit: www.matthewzachary.com. Also see the OncoLink Survivor Story Matthew Zachary: The Healing Power of Music.